For the longest time, removing makeup was a misery to me. I didn’t want to do anything to damage my skin, but boy, trying to remove all of my makeup (which is usually waterproof/stubborn) is a hassle for sure. This is the method I use to remove my makeup, which is fairly quick and does a good job of getting rid of all my makeup without destroying my face! Since your lip and eye makeup is usually the most stubborn, you’ll want to start with that first. I use a point makeup remover (my favorite is the SkinFood Milk Shake Point Makeup Remover) and put some on a flat cotton pad. 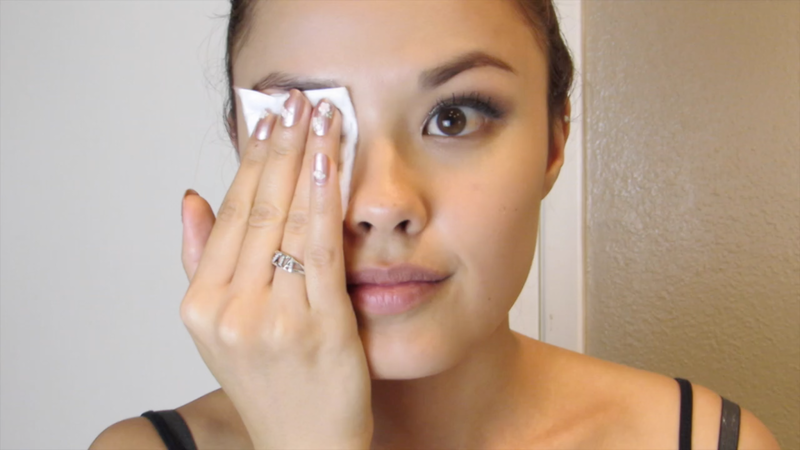 I then hold it over my eye for 30 seconds, which allows the makeup remover to dissolve some of the makeup. You then went to gently swipe the excess eye makeup off with the pad. Be gentle! At this point, I’m usually in the shower because for me, it’s just easier to do the rest while I’m showering. But next, I use a cleansing balm or oil to break down my face makeup and the rest of my eye makeup. I’ve been using this one from Skinfood, which is their Black Sugar Deep Cleansing Balm, but my personal favorite is Banila Co’s Clean it Zero! Massage your skin with the product until you feel like your makeup has loosened up. When I go over my eye area, I use my finger tips to gentle massage my eyelashes to get all the mascara off. Then rinse! Oh, eye makeup, you never like coming off my face easily. I usually have to go back with a little bit of my point makeup remover and some q-tips and gently remove anything left around my eyes. Time for deep-cleaning! I’ve been using this cleansing brush (You can buy it HERE and use code “BeautyBreakdown” for 70% off! Holy Crap! Don’t buy it full price! haha). I usually use the rubber brush because it’s gentler on my skin from day-to-day, but in this video I used the grey brush. Finally, rinse your skin and pat dry! Apply your toner and the rest of your skincare and you’re good to go 🙂 Happy makeup removal!